Take on the role of Adonia, an up and coming goddess, and overcome numerous challenges in your quest for immortality. The journey begins on Mount Olympus where on accepting to undergo the trials of the Guardian you are swept away to your first challenge. 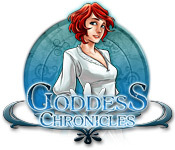 Use your keen power of observation to find and assemble artifacts that lay hidden among ancient and exotic scenes in Goddess Chronicles, a fun Hidden Object game.